Encore! Mt. Morris will host the grand opening August 3rd (6-9:30pm), complete with refreshments and four fiber art demonstrations. The show will run through the month of August on Friday evenings and Saturday afternoons, when activities related to the Straw Sculpting Competition are taking place on the Mt. Morris Campus. “Artful Threads Through Time” features many kinds of fiber arts, such as weaving, quilting, hooked rugs, fabric painting, crocheting, basketry, and more! Some of the pieces are of original design by current fiber artists; others are fascinating examples of fiber arts from the 19th and 20th centuries. 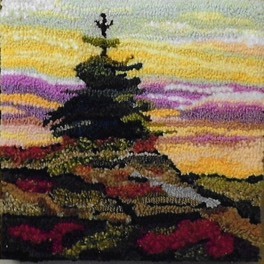 Demonstrations of fiber arts will be conducted in the gallery between 6 and 8pm both August 3rd and August 10th, including hooked rugs techniques, bobbin lace, weaving, hand quilting, crocheting, etc. Visitors will have the opportunity to indicate an interest in one of the fiber art classes to be offered later in August or September. Concurrent with the art show are the Friday evening Jamboree band concerts in the next-door bandshell and by August 10, the Straw Sculpting competition activities on Saturdays throughout August. Encore! Mt. Morris is composed of volunteers committed to developing Mt. Morris, IL into a unique, thriving rural and cultural arts destination in northwest Illinois. Volunteers and donations are welcome. Learn more at EncoreMtMorris.com.